Join us on October 24 at the Orradre Building at the Salinas Valley Fairgrounds in King City from 8:30 am to 12:00 pm to learn what you need to know to comply with Senate Bill 88. Cost is $25/person. 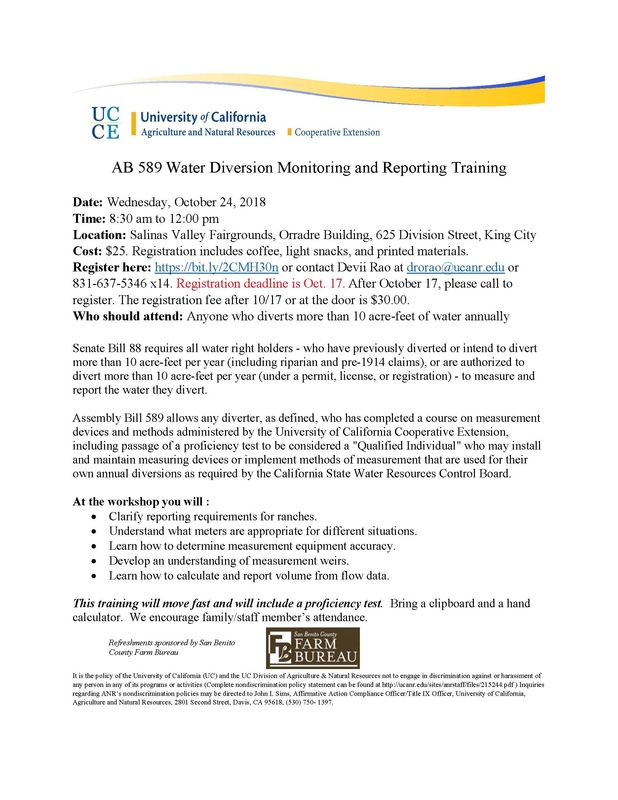 Register here: https://bit.ly/2CMH30n or contact me at drorao@ucanr.edu or 831-637-5346 x14. See attached flyer for more details. Many farmers and ranchers are concerned about complying with Senate Bill 88, which requires all water right holders - who have previously diverted or intend to divert more than 10 acre-feet per year (including riparian and pre-1914 claims), or are authorized to divert more than 10 acre-feet per year (under a permit, license, or registration) - to measure and report the water they divert. Assembly Bill 589 allows any diverter, as defined, who has completed a course on measurement devices and methods administered by the University of California Cooperative Extension (UCCE), including passage of a proficiency test to be considered a "Qualified Individual" who may install and maintain measuring devices or implement methods of measurement that are used for their own annual diversions as required by the California State Water Resources Control Board. People who divert 100 acre feet or more per year will be required to take the UCCE course. Farmers and ranchers who divert more than 10, but less than 100 acre feet per year are not required to take the course. However, people in this category are still encouraged to come because the course will be help them learn the best ways to measure and report on their diversions as well. Click here to learn more about Water Board requirements for measuring and reporting the diversion of water.